Cupcake Novelties rated 5-stars on Wedding Wire! Shop Online & Earn FREE Cashback! Save more with Ebates - Click to find out! View LOTS more pictures & "Like" Us on Facebook for Free Giveaways! Note: Cupcake Novelties does not guarantee its products are allergen free. Many products contain or may come into contact with milk, wheat, nuts or other allergens that may cause allergic reactions in some individuals. It is up to the client to inform their guests if a product served contains such ingredients. Cupcake Novelties cannot be held responsible for any allergic reactions in people who consume our products. Mix and match from the list of flavors and fillings/frostings below or scroll further down to choose from our Specialty Gourmet line of cupcakes & Cheesecake Cupcakes! Made from Scratch Custom Fondant Cakes, Cupcakes, Cake Pops, Decorated Sugar Cookies, Pies, Cheesecakes & more! We use premium quality organic ingredients and all orders are baked fresh. Try our moist fluffy cakes enrobed with delicious fresh fillings and icings! All fondant is prepared from scratch and used to hand-sculpt our custom decorations! We offer traditional buttercream and whipped cream in the following flavors. Feel free to suggest your own and we can work something out! * Gluten Free cupcakes start from $38/dozen +tax, and the final price depends on the flavors chosen. * Cupcakes with fondant decoration start from $36 per dozen +tax and depend on the design & decoration. * Add $0.50 per cupcake for your choice of filling. Choose from the frosting options for your fillings or suggest your own! 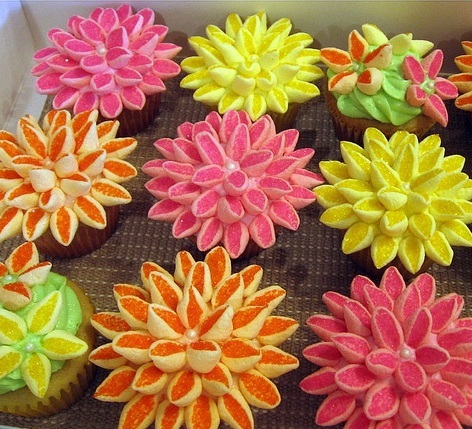 * Marshmallow flower cupcakes are $38 per dozen +tax. Great for Spring/Easter or Garden-themed parties or any occasions needing a bright cheery touch! Chocolate Covered Strawberries are $28/dozen. Purchase them as is or add them on top of any cupcake! Can be customized with any color/decoration/sprinkles and more! 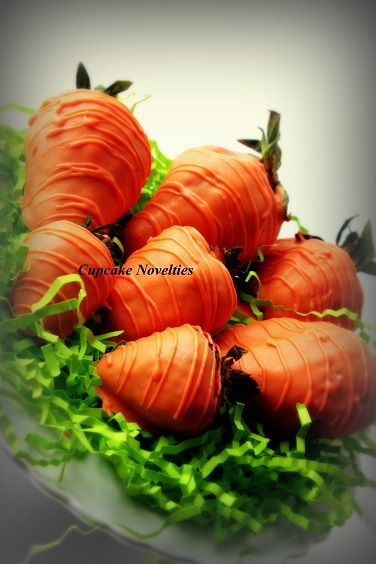 Chocolate-covered Strawberries 'Carrots' for Easter! All gourmet flavors contain a filling and a frosting. Orange Dreamsicle - Moist Vanilla cupcake filled and topped with light and fluffy orange-marshmallow buttercream. Apple Pie - Cinnamon cupcake filled with yummy apple pie filling and topped with caramel buttercream and a drizzle of homemade caramel. Key Lime Pie - Buttery Vanilla-Lime cupcake filled with fresh key lime curd and topped with key lime buttercream and crushed graham crackers. Banana Caramel Delight - Moist Banana cupcake filled with your choice of delicious liquid caramel or caramel buttercream and topped with caramel buttercream and a drizzle of homemade caramel. Chunky Monkey - Moist Banana cupcake filled with homemade caramel sauce and topped with chocolate ganache and a drizzle of caramel and crushed salted peanuts. Chocolate Mint Grasshopper - Yummy Chocolate cupcake filled with refreshing mint ganache and topped with mint-chocolate ganache and a mint leaf. Nutter Butter - Moist Chocolate cupcake filled with crushed peanuts & chocolate ganache and topped with rich chocolate ganache and chopped Reese's Peanut Butter cups. Black Forest - Decadent Chocolate cupcake filled with homemade cherry filling, topped with whipped cream, a cherry and chocolate curls. Pink Lemonade - Yummy Lemon cupcake, colored pink, filled and topped with fresh lemon buttercream. Can be made without the pink color too! 9-inch round cheesecakes, serving 10-12 people start from $45 +tax and custom designs can be done for an extra charge (see pics below!). Cheesecake Cupcakes are $40/dozen +tax. Choose from a buttery graham cracker crust, a yummy chocolate cookie crust or an Oreo cookie crust. All cheesecake cupcakes come with a swirl of whipped cream. Homemade cheesecake topping sauces available so you can serve vanilla cheesecake cupcakes and have guests customize their cheesecake cupcakes with their favorite topping. Contact us for details! 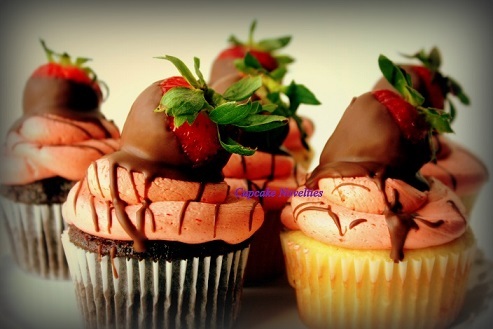 Cheesecake Cupcakes can also be a part of our Cupcake Towers! 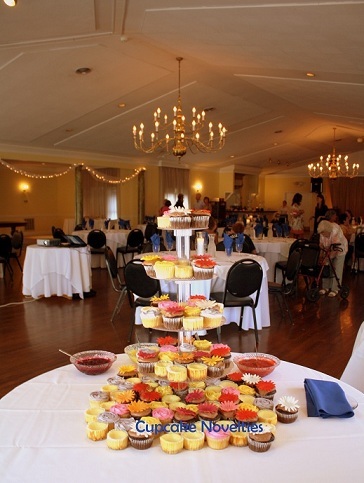 This Wedding Cupcake Tower had a combination of custom decorated vanilla cupcakes, chocolate cupcakes and Cheesecake cupcakes. Four toppings (cherry, blueberry, lemon & strawberry) were provided in bowls by Cupcake Novelties so guests could mix & match to make their favorite Cheesecake cupcake flavor! We offer traditional buttecream or whipped cream frosting in the following flavors. Feel free to suggest your own and we can work something out!